Infomercials have long tried to fool people into thinking they were watching legitimate TV programs. Infomercials have most often tried to disguise themselves as talk shows, but some have tried to pass themselves off as travel shows, news broadcasts, home shopping channels, and even sitcoms. This effort at disguise was worse back in the late-80s/early-90s, and it was even a source of controversy, as some people called on the FCC to crack down on this “deceptive” type of advertising. In the years since, people have gotten more familiar with infomercials, so infomercials have made less of an effort to present themselves as something else. I have, however, recently seen an infomercial which I think wins the award for best effort to disguise itself as a legitimate TV program. The infomercial is for a website called Winning Edge. Winning Edge is a sports handicapping service which offers “picks” to gamblers who wager on sports. Infomercials for sports handicapping betting services are not new. I remember seeing several of them back in the mid-90s. But the sports betting service infomercials I saw back then were among the cheapest, chintziest things on the air. Perky blonde host: The Raiders are playing at Denver this Sunday. Should be a pretty high-scoring game. 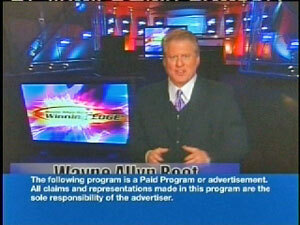 The Winning Edge program is a light-years improvement in quality over those older crappy sports betting infomercials. One thing these that sets all these sports betting infomercials apart from most other TV infomercials is that they produce a new program every week, unlike most infomercials which produce one program and run it over and over for months or years. The sport betting infomercials do this because they need to offer “picks” related to upcoming games. Also, the sports handicapping infomercials generally show up in the fall, when football season makes people more interested in wagering. 1. They offer people their top pick free for three weeks. 2. They tell 50% of the people to bet on one team and the other 50% to bet on the opposing team. Of course, the pick that half the people get turns out to be a winner. 3. Nearly all those 50% with the winning pick call back the next week. Again half those people get told to bet on one team and half get told to bet on their opponents. So 25% percent of the original callers now have gotten two winning picks in a row. 4. The third week those 25% call back. The same strategy is employed, so now 12.5% have gotten three winning picks in a row. Those people think the guy giving them the picks is an absolute sports handicapping genius and are very willing to spend hundreds or even thousands of dollars to subscribe to whatever worthless “picks” service that man is offering. It’s clever marketing strategy at least.